RadCalendar for Xamarin allows you to easily implement various calendar scenarios in your apps built with Xamarin.Forms. The control capitalizes on all the innate benefits of the native UI but exposes all objects and properties in C#, allowing for no-compromise customization and flexibility. 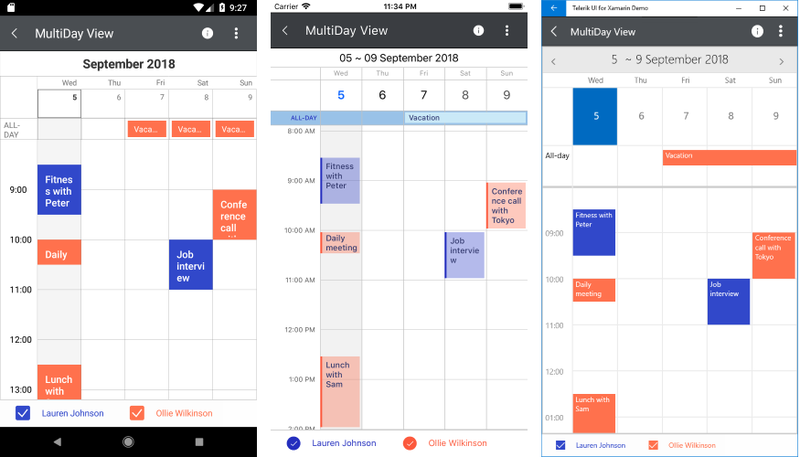 Different view modes support: The Telerik Xamarin Calendar features year, month, week, multiday and day views. Read the View Modes topic for more information. Selection: RadCalendar supports single selection functionality. The selected date can be changed programmatically or when the user taps on a calendar cell. Read the Selection article for more details. Appointments: Using RadCalendar you can create appointments for a particular date out-of-the-box. For more information on this check the Appointments topic. Recurrent Appointments: The control provides the functionality to configure repeating appointments. The user has the ability to apply recurring scheduling patterns such as daily, weekly, monthly or set a range of recurrence from date to date. Check Recurrence Overview topic for more information on this. Scheduling UI: RadCalendar introduces built-in UI for creation and modification of appointments, so you could provide users with the ability to directly schedule their meetings. For more details on this check Scheduling UI topic. Flexible Styling API: Thanks to the control’s flexible API you have the freedom to style each separate date cell as well as the appointments according to your specifications. Read more about the Calendar styling capabilities in the Styling section.